Beat and I finished the Susitna 100 on foot in 41 hours and 16 minutes. All I can say about it right now is — wow, that was really hard. The race was actually much harder than I anticipated, not only in physical effort, but also pain and cold management. As it turns out, traveling 100 miles really is a lot more difficult without a bike — who knew? It was an interesting year for the Susitna 100. The weather was clear and cold, with colorful skies and incredible views during the day, and overnight temperatures dipping as low as 19 below with a 20 mph headwind. The trail was well packed, awesome for cycling, but the new snow made for tough footing. The fine powder was still very sandy where our little feet punched through. It was very taxing to maintain a 2.5 walk pace, much like trying to run 100 miles in crusty sand. The snow was also very cold, which makes it very sharp — meaning no glide for our sleds. There was a lot of resistance all around. What else can I say about it? My feet hurt a lot. So do my legs. No injuries, but the usage pain alone led to a minor mental breakdown around mile 70, when I realized I was going to have to endure the pain I was in for at least 13 more hours. 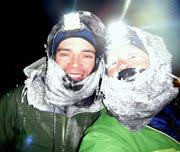 Beat and I decided to stick together from the beginning and it was really great to have him around for my low points, even when I got really grumpy and at one point snapped at him that I hoped I didn't finish the Susitna 100 so I wouldn't qualify for any other dumb 100-mile foot events. He also helped me zip up my coat when my fingers froze and refused to work amid a desperate layer-adding effort in the intense windchill on the Yentna River. Did I mention it was really cold? That also made the run that much harder. Yeah, it's hard to eat and drink when your whole face is crusted in ice. I'll write up the race report at a later date. It really was one of the more intense experiences of my life — did I also mention we were out in the cold without sleep for two nights, not just one. We certainly did a checkpoint comfort tour with the five indoor stops on course, so we did have chances to warm up and reconnect with the real world. But by the second sunset, with all that leg and foot pain coursing through my nerves, my thoughts ventured into new head spaces I'd never before found. Which is the reason why I seek out this sort of stuff — long, difficult slogs that are way over my pay grade. I need to occasionally be reminded that I am weak and small and the world is huge and incredible and mean, and even the world is just weak and small in the grand scheme of the universe. I fall in love the world from this perspective. It's consistently awe-inspiring, even when it's reduced to the tiny beam of my headlamp. And it was so much fun to share it with Beat, with my new friends Steve and Danni, and with many of the Alaska cyclists I've met over the years. It was incredible to return to Alaska. It helps me realize how much I really miss it, but also that it's still here. I took lots of pictures, and even a bit of video. Check back again! Awesome! So glad you made it the whole way, that is so cool! You rock, and Beat sounds like the best trail partner ever. I'm just humbled by your awesomeness. Congratulations on your achievement! I checked your Spot, went for a hike and checked the Spot, went for a ride check-Spot, woke up check-Spot, go for ride check-Spot, woke up---wow. It’s always weird watching someone’s Spot slowly track across a route for hours/days on end while you go about your normal routine. so happy you finished. what a sense of accomplishment! Congratulations, Jill. You're awesome. Starting is easy. Finishing is a huge accomplishment. Way to go! That is so cool! Congratulations! I don't even know you and I'm SO proud! Amazing Jill!! I am excited for you. Way to tough it out and beat that course! I can hear the excitement in the tone of this post - yup, you had yourself an EPIC adventure! Look forward to hearing, more, more, MORE!! Been waiting all day to hear. Thanks for the short recap. Can't wait for the long one and hope it is, want to hear everything. Congratulations!! Watched the Sustina update page and the Spot. You never cease to amaze me with your determination and endurance. Congratulations on your finishing and having a loved one at your side to do so. I knew you would make it, Jill! You are tougher and stronger than you give yourself credit for. So happy for you!!! "I need to occasionally be reminded that I am weak and small and the world is huge and incredible and mean, and even the world is just weak and small in the grand scheme of the universe." This is good stuff. Congratulations on finishing! Jill, mega-congrats! I checked your SPOT today and I thought, my God, she's still OUT THERE! Then I realized I was reading it wrong and you were finished! YAY! You are strong in ways I just can't imagine. I thought I was suffering today when I had to be in a 2-hour meeting without LIP BALM. Great to hear...Any chance you're swinging through Juneau on your way south? What a great picture of the two of you. It's been nothing but smiles and adventures since you met Beat. So cool you could do this together. I too was refreshing your Spot page over and over and over. You are an absolute CHAMP! Congratulations to both you and Beat, well done you. Just amazing. I've been stuck on my couch (with a fractured knee) watching virtually every 10 minute update from your SPOT for the last 2 days. Congratulations and thanks for the inspiration. Congratulations! From what I've read on your blog, I'm guessing that you're already planning your next ultra-adventure. Congratulations on this huge accomplishment. I don't cycle (other than around town) and I don't race (on foot or on bike), but I want you to know that you inspire me. You inspire me to be a better person to myself and to those around me. Frickin' awesome. Well done. You look so happy. Crusty, but happy. Aw – I'm so glad you made it! I've been reading your blog for years (although I rarely comment) and found myself looking at your Spot page a few times this week-end to track your progress.I was rooting for you guys all the way from London, UK! At some point I asked my boyfriend "Jeez, does checking her page makes me a stalker or something? I don't even know her!" to which he replied semthing like "no, it's probably nice to have lots of your blog readers thinking about you". In a karmic way, or something. That picture of you and Beat is lovely. Well bloody done. Hope to chat with you and Beat about it at some point in CA or MT. That picture is priceless...way to go!!! Both of you are beyond crazy! Congratulations on an amazing achievement! Congratulations! I knew you could do it! You are awesome. Many that's a long time to be on foot. I can't wait to see the pics and video! Awesome. Congrats to you and Beat! You rock, Jill. No two ways about it.